You would have never geussed. It's DBZ BT 3!! Yes, a new addition to the series.. Again. I liked the other games so I Guess I have to buy this one TOO. Just for the extra 20 characters. Damn €50-60 for 20 characters and some minor changes. Oh well. Atari will be bringing another round of the Dragon Ball Z action fighting game series to the Wii and PlayStation 2 "during the 2007 holiday season." Dragon Ball Z: Budokai Tenkaichi 3 will be the "ultimate chapter," according to the company, and will feature 20 characters that have not been seen before in the video game adaptations. The latest game is being developed by Namco Bandai and Spike. Atari's senior product manager, Emily Anadu, commented, "[These characters include] Nail, King Cold and King Vegeta and battle stages that fans will love. Each year, the developers refine the game to bring fans closer to feeling like they are actually playing the show." The latest game will also have a number of new features, including more than 150 playable characters, enhanced fighting techniques, and more than 20 battle stages. The Wii Remote will also feature an improved control system that will be used to "allow players to easily mimic signature moves and execute devastating attacks as they are performed in the Dragon Ball Z animated series." Another feature will be the addition of day and night stages, with the power of the moon giving players different ways to transform their characters. It's going to be a bunch of cheap cranked out game like mainly others. They don't take any good time on these, that’s why there is a new one every year. They should move this game to Playstation 3 as well, and bring back the 3d cinematics and good game play like the first one did. Stop making more characters and then just selling the game and so on. 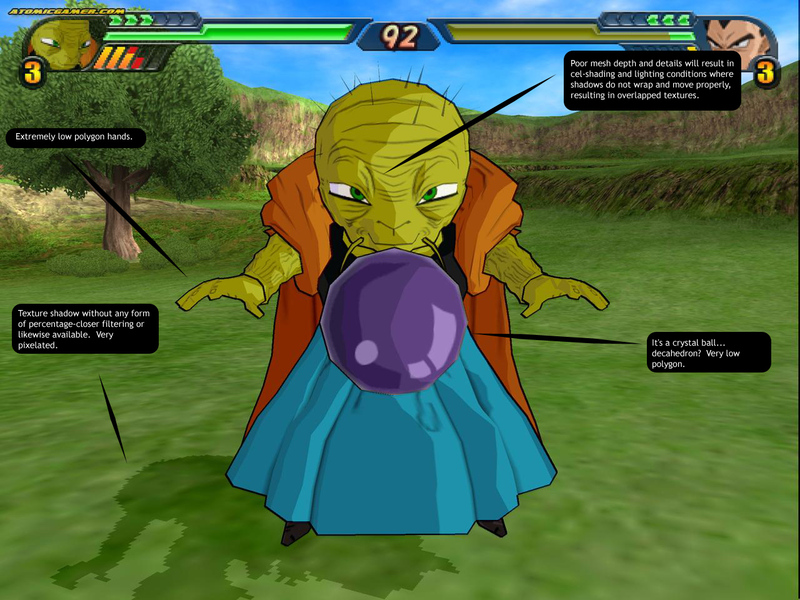 Create a vast RPG world like dbz was intended to have with exploration and in-depth story. by the way... what the heck?????? I created that topic.... Why its yours??????? well for the Wii version you get some extra characters and an extra space map if remember correctly. Love the sparking games too by the way. in my opinion a lot more vivid to play than the budokai series, though a little less deep. I read on some dutch site that there will be 3 characters specially made for the game. With there own story that evoleves around a meteor. That's why they call it Sparking METEOR. ssdd, I'm not playing through another single player of Budokai, 3/4 times is ENOUGH. If it where an online multiplayer, maybe I'd get it..
Whoa, Babidi is a character? Well, at least it looks like they're adding a new fighting concept. From what I'm seeing, it looks like they're adding characters who are no good in a fight, but allow them to summon their henchmen to do their bidding. Or else, the henchmen are part of their special moves. Really, as long as there's a significant change, I don't mind seeing new updated versions of the game. Tenkaichi 1 was a disappointment. Tenkaichi 2 was a blessing in comparison, though a little heavy-handed, although I'd say it offered the most realistic DBZ experience to date. If history repeats itself, Tenkaichi 3 will probably seal up plenty of gameplay cracks and give us a VERY decent game. After all, we'e only seen a little bit of what they likely have in store. Budokai 1 and 2 were lackluster, but then Budokai 3 came in and creamed nearly every DBZ game ever made. Maybe third time really IS the charm ? They are all the same. Every last one of them. Since the old budokai1, all the way to the new free roam ones. 150 characters which are, in fact, 3 different ones. A completely skill-less gameplay (no, timing your buttonmash doesn't count as skill), and absolutely no character flavour. And, no, gigantic attack cutscenes don't make the game any cooler. It's like non-skippable dialogue in a game. Personally, I'd say that the budokai series is one of the worst fighting games ever made, and is only popular because it's... well... DBZ. No one seems to mind that their using the mostly the same character models and maps from previous games, I see. Additionally, is it just me, or do these characters look a little... under par in quality. Not that graphics should be the main driving force behind a game, but when you badly uvwmap some areas, use low-resolution 256x256 or lower textures for a full body, and set a limit of 100 triangles and try to make a hand; it tends to start looking blocky and blurry. Babidi's texture-based shadow doesn't even have any form of percentage-closer or any filtering of any type -- giving it a nice, fresh PS1 gleam. That goes on to say that there's not much mesh depth information to offer the lighting algorithm, resulting in REALLY poor shadows that overlay and cover areas where they should actually be offering better lighting results. The outlines as well are based on a simple brute force, dual-pass silhouette only vertex offset approach and while this isn't bad in itself, you need to take into account model angles else you'll be getting very bad artifacts on edges. Additionally, while it's hard to ascertain from the screenshots, it seems they have consistent line width at all distances -- resulting in too thick lines in extreme closeup instances. At least they tried ... I think. Basicly all what Zeth typed , plus im adding my personal dislike for using the same models and maps all the time. They should spend their time for improving their quality, Instead of throwing in all the same pieces. Zeth wrote : No one seems to mind that their using the mostly the same character models and maps from previous games, I see. Additionally, is it just me, or do these characters look a little... under par in quality. Not that graphics should be the main driving force behind a game, but when you badly uvwmap some areas, use low-resolution 256x256 or lower textures for a full body, and set a limit of 100 triangles and try to make a hand; it tends to start looking blocky and blurry. Babidi's texture-based shadow doesn't even have any form of percentage-closer or any filtering of any type -- giving it a nice, fresh PS1 gleam. Honestly, I can't wait to see Atari's reaction when ZEQ2 is released. After they realize they can't legally screw you over, you're probably going to get offers made for employment, or they may even try to buy ZEQ2 off of you, or maybe even the ZIOS engine. Or heck, they may just realize they need to get their behinds in gear and actually try to out-do ZEQ2. I highly doubt there will be any form of reaction to ZEQ2 from Atari. Well... I wouldn't be so sure Alex... After all ZEQ2 is one heck of a work! I'm really damn proud to be a part of this amazing team! I wasn't trying to directly talk Atari down or directly make a comparison in any way, but I do feel that from a developer to developer central standpoint on the platform and market they are targeting, they could have put forth more effort had they chosen too. The Playstation 2 platform has a lot more capability than they are exercising. On a completely project neutral level, we could quite easily meet the hardware specifications that their platform offers. This is more so a matter and recognition of content reuse rather than improvement in a project. A marketing method to squeeze out the same game with a couple new bells and whistles. It's not something that's just reserved for DBZ games as it's been done in the industry for quite some time. I simply chose to point those things out because a discussion thread was made concerning it on the zeq2 forums. Had another game been posted, I would have directed my comments accordingly in the same light. I was trying to express thoughts on the industry as a whole for it's fiscal-driven tactics. I remember when I saw them for the first time... it was Budokai 2! Me and my pal, Konrad, used to play it everday! Then Budokai 3 was published! It was totaly awesome! New chars (and models ) story mode and many more! I thought that it was the best game ever! I even considered buying Playstation 2 only for this game (well, maybe for some other as well ). Some time passed... I became good at modeling... I even joined the ZEQ2 team! Thanks to that I become really good in modeling... It's so awesome to work with them! I think that this team has very bright future! Thanks to them and some new modeling techs they taught me I knew, that I was better than Budokai 2 artist! And now you guys give us the info about Tenkaichi 3! I'm really disapointed about it! I thought... I dreamed that Budokai Tenkaichi 3 can shine as Budokai 3! My dreams were ruined when I saw the screenshots! Atari is slacking off, thinking only about more and more money! Thanks to you guys, I am now absolutely sure that I'm better then them! I would even feel offended, if someone were to compare my work to their artist's work! Sorry for the long post, guys. I just had to write it... That's only my point of view and you may or may not agree with it. Still I can't Believe how dissapointed I am with BT3! For all as I care, it could be a Playstation 3 game with hollywood-par graphics. It would still fellatiate (take THAT filter!) donkey balls. Only the donkey balls z would be in hi-def. Yeah... well it's really hard not to notice that Budokai series is not using the fullest of Playstation 2! I mean come on! How many fighting games have you seen for Playstation 2 with more detailed chars? :O I agree about polylimt, still they SHOULD improve! And don't really think that polylimit is restricting them... <.< I think that they are just lazy to do something new! Still... maybe I'm just to harsh on them?